...a really long walk. A 3 day long walk. And why? Because she's helping to put an end to cancer for you, for me, for my daughter, for your daughters...you get the picture. I'm inspired by her want to walk 60 miles in 3 days. I'm grateful that she's willing to go through the training and preparation to make an impact. In fact, when I think of the legacy she's leaving for myself and my daughter, it brings tears to my eyes. So, to my mom, I say thank you. Thank you from the bottom of my heart. You are so caring and giving. Your heart is bigger than life and I hope that mine can grow to be as big as yours. And to you, dear readers. 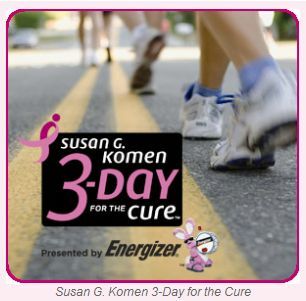 If you would like to be a part of the Susan G. Komen 3-day walk by supporting someone who's walking, may I suggest supporting my mom? All you have to do is click this link and it will take you to a secure page where you can make a donation. Also, any companies who would like to donate and have a place on a T-shirt she's having made can click the same link to donate to her. Be a part of bringing change for women everywhere. For those who have gone before us and for those yet to come.